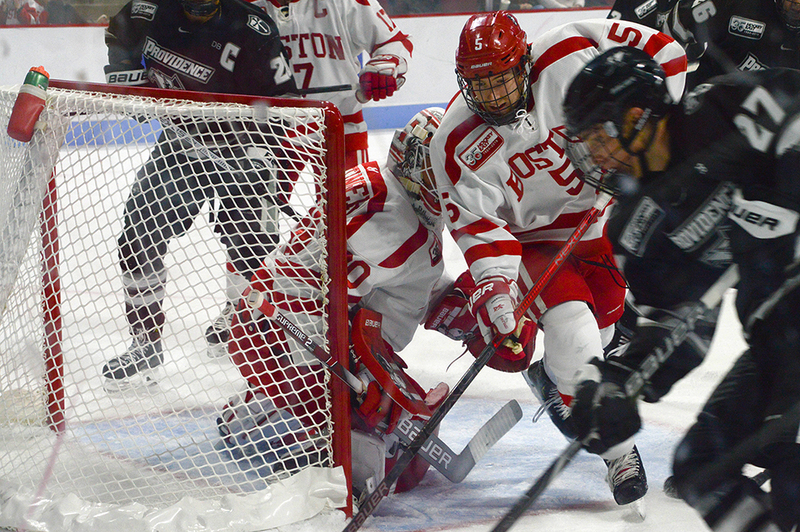 Coming off a one-point weekend against Boston College, the Boston University men’s hockey team sets its sights on another in-state rival — University of Massachusetts Lowell. Although the Terriers (4-7-2, 4-4-2 Hockey East) failed to record a victory against BC (4-6-2, 4-1-2 Hockey East), BU head coach Albie O’Connell did see some positives from his team. Last season, the Terriers and the River Hawks (7-6-1, 3-3-1 Hockey East) split the series with the home team emerging victorious. Then-freshman defenseman Cam Crotty recorded his first collegiate goal in the victory at Tsongas Arena on Dec. 9, 2017. Last Saturday’s 0-0 tie marked the first time since the 2015-16 season that BU has been shutout three times in one season. BU has not been shutout four times since the 2003-2004 season. The Terriers have failed to reach the multi-goal mark in four of their previous five contests. O’Connell noted that although his team is not scoring, it is not because they are passing up chances. This season, junior defenseman and co-captain Dante Fabbro is the sole player on the Terriers with at least 10 points this season. The New Westminster, British Columbia, native leads the squad with 12 points, with nine points in 10 conference games. The struggling offense will be challenged by River Hawk goaltender Tyler Wall. Wall’s 1.80 goals against average and his .933 save percentage are good for first and second in the conference, as well as eighth and ninth in the country respectively. Against Hockey East opponents, Wall’s goals against average is fourth (2.18), and his save percentage is sixth (.917) among the 11 qualied goaltenders. Last season, Wall started in BU’s 9-3 victory over UMass Lowell. He played 32:53 minutes and allowed six goals off 27 shots. Senior goaltender Christoffer Hernberg spent last season at the main goal stopper for the River Hawks, however this season he has appeared in just four contests. Junior forward Ryan Lohin paces Lowell with 11 points. The Tampa Bay Lightning prospect is recording nearly two points per conference game this season, registering seven points in four games. Terriers’ junior goaltender and assistant captain Jake Oettinger will be tasked with slowing down the River Hawks offense which averages 2.79 (fourth in Hockey East) goals per contest. During November, the Lakeville, Minnesota, native’s .934 save percentage placed 14th in the nation and third in Hockey East while his 2.12 goals against average slotted him third in the conference. Oettinger saw 258 shots and made 241 saves during November. He led the country in both of those categories. This series will be the last for Crotty and sophomore forward Shane Bowers before they leave for Team Canada’s International Ice Hockey Federation’s 2018 World Junior Championship selection camp with hopes of making the final roster. Being named to the preliminary roster is not lost on Cotty. “It’s crazy,” Crotty said. “… It’s something that you’ve been watching since you were three or four. Especially, being from Canada it’s a huge, huge event, so even being in the conversation for that is pretty special. So whatever happens with it I’m going to soak everything in because it is a huge honor.